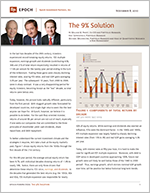 The 9% Solution - Epoch Investment Partners, Inc. In the last two decades of the 20th century, investors experienced record-breaking equity returns. P/E multiple expansion, earnings growth and dividends (contributing 43%, 36% and 21% of total return respectively) resulted in returns of 17.6% per annum for the twenty-year period ending in the turn of the millennium. Fueling those gains were sharply declining interest rates, soaring P/E ratios, and real GDP gains averaging 3.3% per year. The subsequent 10 years, from 2000 to 2009, were in sharp contrast. It was a very disappointing period for equity investors, becoming known as the “lost” decade, as total returns were below zero. Today, however, the picture looks radically different, particularly from the first period. With sluggish growth rates forecasted for developed countries, mid-single digit returns seem like the best anyone can hope for. At Epoch, however, we believe it is possible to do better. For the cash flow-oriented investor, returns of around 9% per annum are not out of reach, especially if one seeks out companies that are committed to the three principles of shareholder yield: cash dividends, share repurchase, and debt repayment. To better understand the current investment climate and the strategies it requires, let’s take a look at the equity market’s past. Figure 1 shows equity returns from the 1930s through the first decade of the 21st century. For this 80-year period, the average annual equity return has been 9.7%, with individual decades showing returns of -1.0% to nearly 19%. Notice, there are only three drivers that determine these returns: P/E ratios, earnings, and dividends. In the decades that generated the best returns (e.g. the 1950s, 80s and 90s), P/E multiple expansion was responsible for nearly 50% of equity returns. While earnings and dividends also exerted an influence, P/Es were the dominant factor. In the 1980s and 1990s, P/E multiple expansion was largely fueled by sharply declining interest rates (from 13% to 3%) and real GDP gains averaging 3.3% per year. Today, with interest rates at fifty-year lows, it is hard to make the case for significant P/E multiple expansion. Moreover, with debt to GDP ratios in developed countries approaching 100%, future real growth rates will likely be well below those of the 1980 to 2000 period1. Thus, earnings growth, which mirrors nominal GDP growth over time, will be positive but below historical long term trends. With these forecasts in mind, we can build a simple model of expectations for equity returns. Let us begin with the cash yield for global equities and assume that global corporate earnings growth will indeed mirror global GDP growth going forward. The developed world may be growing at a sluggish 2% rate, but the developing world, which will provide nearly 50% of global growth this year, is growing almost three times as fast. Real GDP is determined by the growth in the work force (e.g. man hours) plus productivity (e.g. output per hour). Add inflation to real GDP and one arrives at a proxy for global GDP and, thus, earnings growth. All told, global GDP growth/earnings growth in the range of 4 to 6% is a reasonable expectation. And when we add the dividend yield of 2% from the MSCI Index, we arrive at equity returns of 6 to 8%, exclusive of the impact from P/E multiple expansion or contraction. But what if it’s possible to beat this estimate of 6 to 8% by a meaningful amount? Suppose we can build a portfolio with the following characteristics: a minimum cash dividend yield of 4.5%, another 1.5% from share buybacks and debt pay downs, a dividend growth rate of no less than 3%, and an expected portfolio volatility 30% below that of the equity market2. What drives free cash flow? Diageo Plc is the world leader in the manufacture and distribution of spirits and a major producer of other alcoholic beverages. The company has many global brands including Johnnie Walker Scotch, Smirnoff Vodka and Guinness Beer. Annual sales approach £10 billion, with over a third of this number coming from the developing markets. Recurring free cash flow exceeds £1.5 billion and is driven by double digit growth in Asia, Africa and Latin America, and on-going cost cutting programs. The £1.5 billion of free cash fl ow is net of £1.4 billion of investments in the company’s brands and £206 million in acquisitions. Management paid £914 million in cash dividends in the fiscal year ended June 30, 2010 and has proposed a 6% increase for the up-coming payout. The current dividend yield is 4.0%. Additionally, net debt was reduced by almost £500 million in the most recent fi scal year. While share buy backs were suspended in FY10, management intends to return to a more balanced shareholder return strategy in the future. Since 1998, Diageo has paid out cash dividends of £10.3 billion and has bought back stock for £11.8 billion. BCE is Canada’s largest integrated telecommunications company with sales of approximately C$18 billion. The company serves fixed line customers in Ontario and Quebec as well as the Atlantic provinces, in addition to 6.8 million wireless customers (up 5% since 2008) and a total of 4 million subscribers in broadband internet and satellite video services. Growth in wireless, internet and video services – in addition to cost cutting programs – have off set declines due to fixed line losses and has driven cash generation approaching C$1.5 billion. Further growth is expected as wireless penetration rises and higher data spend in both mobile and fixed broadband positively impacts subscriber revenues. Spending on network upgrades peaked in 2009 and the recent decrease in capital expenditures has resulted in free cash flow guidance in excess of C$2 billion. Dividends were raised three times in 2009, and the current dividend yield is 5.3%. The company has also authorized a C$500 million share buyback program. Pearson Plc is the world’s leading education company with annual revenues approaching £6 billion. The company publishes various financial papers, trade books, textbooks and electronic education programs under imprints such as the Financial Times, Penguin, and The Economist. Since 2005, Pearson has invested £2.3 billion in the business, focusing on digital platforms (31% of total sales in 2009) and international markets (12%). Additional growth has come from market share gains from competitors who have not maintained sufficient investment in the text book market. Annual free cash fl ow exceeds £700 million. Pearson paid £273 million in dividends in 2009 and the current yield is 3.9%. In addition, the company recently reduced net debt by £368 million. Since 2005, the company has returned £1.5 billion to shareholders. Management’s current goal is to balance the investment of free cash flow in growth opportunities with consistent and growing returns to shareholders. Kimberly Clark is a global health and hygiene company with a family of well known brands, strong market share positions in more than 80 countries and annual sales of over $19 billion. Management continues to drive growth through brand investment, innovation, and emerging market exposure. Moderate top-line growth and additional cost cutting measures focused on the supply chain allows Kimberly Clark to continue to drive earnings growth. Earnings growth, coupled with cash conversion improvements and disciplined capital expenditures, position Kimberly Clark well to continue to generate stable free cash fl ow of over $2.6 billion and well in excess of the dividend. Kimberly Clark remains committed to returning free cash flow beyond the dividend to shareholders of $986 million through share repurchases and has no interest in building cash on the balance sheet. In 2010, the company has nearly completed the anticipated annual share repurchase program in the first six months of the fiscal year, realizing higher than expected improvement in the cash conversion cycle, and thus allocated the improved cash flow expectations to a 30%+ increase in share repurchases. For fiscal 2010, management expects to repurchase approximately $750 million of stock; nearly 3% of the company’s current market capitalization. The current dividend yield is 4%. Heinz is a global manufacturer and marketer of processed food products with a strong brand portfolio and #1 and #2 positions in many of its markets and annual sales of $10.5 billion, 60% of which comes from outside the U.S. They remain well positioned to benefit from the recession-era trend of at-home dining. Management is keenly aware of the cash flow drivers and has focused on generating profit growth through a combination of top-line expansion and productivity initiatives, focusing on inventory management to improve working capital, and prioritizing capital spending. Top-line growth will continue to come from a focus on emerging markets and core products. Last quarter, sales in emerging markets contributed 18% of total sales and 98% of organic growth. The company’s global presence, strong market positions, and solid brand portfolio position Heinz well to continue to generate substantial free cash flow of around $1 billion, in excess of the attractive dividend. Management has stated that their top priority for cash flow deployment is the protection of the dividend. Beyond that, management continues to reinvest in the business, consider small bolt-on acquisitions, grow the dividend, and pay down debt. Earlier in the year, management increased the dividend by 7%, putting the current dividend yield at 3.7%. In fiscal 2010, management has also substantially lowered debt, resulting in an approximately even distribution of free cash flow between dividends and debt reduction. Management remains financially disciplined with respect to acquisitions and does not anticipate any transformational acquisitions in its future. Instead, the focus is on smaller acquisitions that can either strengthen the core portfolio or help to accelerate growth in emerging markets. Philip Morris International is the world’s leading tobacco company with the #1 cigarette brand in the world, Marlboro, and net sales of $25 billion. While industry volumes have been flat in recent years, declines in the developed markets have been off set by growing volumes in developing markets. With its well-diversified geographic profile, Philip Morris is well positioned to continue to benefit from a growing adult population and an increase in consumer purchasing power in the developing markets. As of June, non-OECD markets represented 42% of total revenues, excluding excise taxes. In addition to maintaining and growing their already attractive market share, Philip Morris successfully continues to implement price increases, control costs, and reinvest in their brands to drive earnings growth. Earnings growth, coupled with working capital improvements, allows Philip Morris to continue to generate strong, predictable free cash flows of $7.2 billion, well in excess of its dividend. Philip Morris consistently returns substantial free cash flow to shareholders through the combination of an attractive dividend yield and sizable share repurchases. Management recently raised the quarterly dividend by 10%, after paying out $4.3 billion in dividends this past year and placing the current dividend yield at 4.1%. Management has committed to returning an additional $4 billion to shareholders through share repurchases (4% of shares outstanding) in 2010. Management completed a $13 billion share repurchase authorization in May and simultaneously initiated a new $12 billion, 3 year share repurchase program. Since the March 2008 spin-off, Philip Morris has returned approximately $20 billion to shareholders. With these examples in mind, let’s return to our proposed “9% solution.” In our view, a portfolio comprised of companies like the ones described above can result in the following: a minimum cash yield of 4.5%, another 1.5% from share buybacks and debt pay downs, and a growth rate of no less than 3%. Taken together, we can achieve a return that is not only higher than most current forecasts, but also boasts an expected volatility that is 30% lower than the equity market itself. The lesson is this: even when the outlook is indisputably grim, the returns from a cash-flow oriented investment strategy can be surprisingly upbeat. This outcome is also reinforced by the 80 year history we looked at earlier in Figure 1 that shows that dividends have accounted for almost 50% of total returns over the long run. While all of our investment services reflect our free cash flow methodology, one particular strategy, Global Equity Shareholder Yield, is a portfolio composed of around 100 companies that grow dividend income at least 3% per annum, pays a 4.5% cash dividend and captures another 1.5% from share buybacks and/or debt pay downs. Possessing an expected volatility 30% less than the market as a whole, such a strategy should weather the economic challenges that lie ahead and provide a “9% Solution” over the long term in a world of potentially constrained returns. 1In This Time is Different, a book by Carmen Reinhart and Kenneth Rogoff that explores the mechanics and psychology of market booms and busts, the authors assert that when debt to GDP approaches 100%, future growth rates fall at least 100 basis points from historical averages: a phenomenon that could last several years. 2For a more detailed exploration of this portfolio construction strategy, please refer to Bill Priest’s book, Free Cash Flow and Shareholder Yield: New Priorities for the Global Investor.